Garden spiders | Arthur in the Garden. 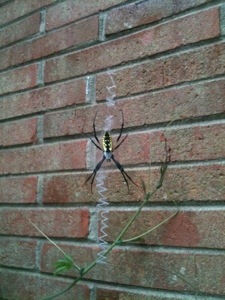 Several of the yellow and black garden spiders have built webs in the garden. 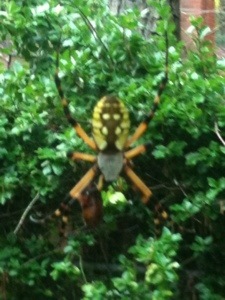 I have always called them ‘yellow and black garden spider’s. They are actually called Black and Yellow Argiope (Argiope autantia). It’s in the orb spider family which build spiral webs about two feet across. The one above is near the lamp post and she is very large – at least 6 inches. The picture is out of focus because she is so large I am frightened to get too close to her. She is in a good location as the lamps are on all night and I am sure she is well fed by the moths and various bugs that are attracted to the light. I think they are beautiful but all spiders creap me out of me! The dense zigzag of silk in the middle of the web is known as a stabilimentum and is thought to either stabilize the web or help camouflage the spider who rest on the web. The male supposedly builds a smaller web near the female but I have never seen two near each other. This smaller spider is against the chimney over a passionflower. He is only about four inches from top to bottom.